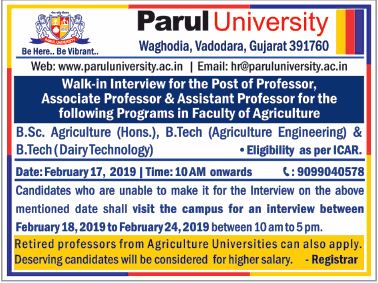 Parul University, Vadodara has advertised in THE TIMES OF INDIA newspaper for recruitment of Professor / Associate Professor / Assistant Professor jobs vacancies. Interested and eligible job aspirants are requested to walk-in on 17th February 2019. Check out further more details below. About College: Parul University is an established university established under Gujarat Private University Act 2009, after legislation passed by the Government of Gujarat on 26th March 2015 giving University status to Parul Group of Institutes functioning under the aegis of Parul Arogya Seva Mandal Trust. How to Apply: Interested and eligible candidates are requested to attend the Walk-in interview with their resume along with originals & copies of certificates and recent PP size photo to the following walk-in address.